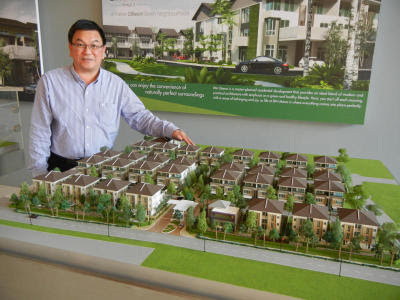 DNP Land will launch its newest architectural gem — The Sentinelle Ville @ BM Utama, a luxurious collection of 66 three-storey semi-detached homes — at the Star Property Fair 2012 in Penang. Its general manager K.C. Tan said the latest project was being launched in response to demand from purchasers for an ultra exclusive gated community within the BM Utama township. “Being a neighbourhood development, we want to ensure that all the homes are owner-occupied. “So we decided to create something unique for the discerning few instead of going for a mega undertaking,” he said. He said the emphasis of the Sentinelle Ville was its spaciousness with a built-up area of 347.8sq m as compared to 232.3sq m for a standard semi-detached house. Tan said there were premium security features such as CCTV surveillance, entry by access card and home alarm system. He said the community clubhouse features a swimming pool, gymnasium, BBQ area, lounge with pantry and a multi-purpose function hall. With a gross development value of RM70mil, Sentinelle Ville is set to become the masterpiece of BM Utama, he said, adding that prospective purchasers, who register their interest in the project during the fair, would receive privilege invitation for the official launching and enjoy early bird incentives. Touted as the premier residential address in Bukit Mertajam, the sprawling BM Utama garden township development spans 36.4ha of freehold land in fast growing Bukit Minyak. Comprising over 700 landed property, Phases I and II have been completed with OC issued while only limited units of Phase III, consisting double and three-storey link homes with modern architectural, are still available. Phase IV is made up of The Sentinelle Ville together with the 32 double-storey link houses of Sere-noa. The latter also features a wi- der and longer built-up area of 198.3sq m.
Another high-end development by DNP Land is the 48.6ha Jesselton Hills located in Alma, Bukit Mertajam. Over 80% of Phase I comprising semi-detached homes have been sold while Phase II consisting of super-link homes will be launched in the third quarter of this year. Touted as Malaysia’s premier showcase for stylish living, the four-day extravaganza will be held at Gurney Plaza and the adjoining G Hotel from July 12 to July 15.